On leave for a sabbatical we rent our furnished and fully equipped apartment in a quiet area in Cassis close to Marseille. Ideal place for those working on the Luminy Campus of AMU. The non-smoking apartment is composed of a living room, a fully equipped kitchen (Gaggenau appliances), one bedroom and one bathroom. The apartment opens to a big sunny terrace on the roof, offering the most beautiful views on the Mediterranean Sea and Cassis. The terrace is furnished with wooden garden furniture, a big table, a Weber BBQ as well as two deckchairs for relaxing. A dining room is installed in a veranda, adjacent to the apartment. Pool (May to September), tennis court and a private parking slot are included. I am a physicist currently at UH in Honolulu. When in france, my husband and I live in Marseille and Cassis. Both places are lovely. 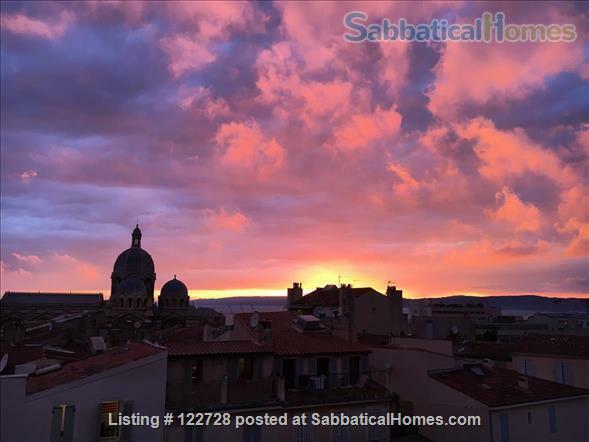 Our home in Marseille is in the old town. A very typical and historical area. Whereas Marseille is the big, interesting city with many beautiful undiscovered places, Cassis is the small Mediterranean village where you can enjoy the charm and lifestyme of the Provence. We love the complementarity of both places.